Lignes d'Azur operates local buses and trams in the Nice (Nizza) - Côte d'Azur area. There is just one tram line T1 operating between the stops called Henri Sappia at the other end and Hôpital Pasteur at the other. The trams are Alstom Citadis 302/402 models. This one is in the city center of Nice running towards Hôpital Pasteur. Picture from Nice 8.3.2018 by Ilpo Ruissalo. 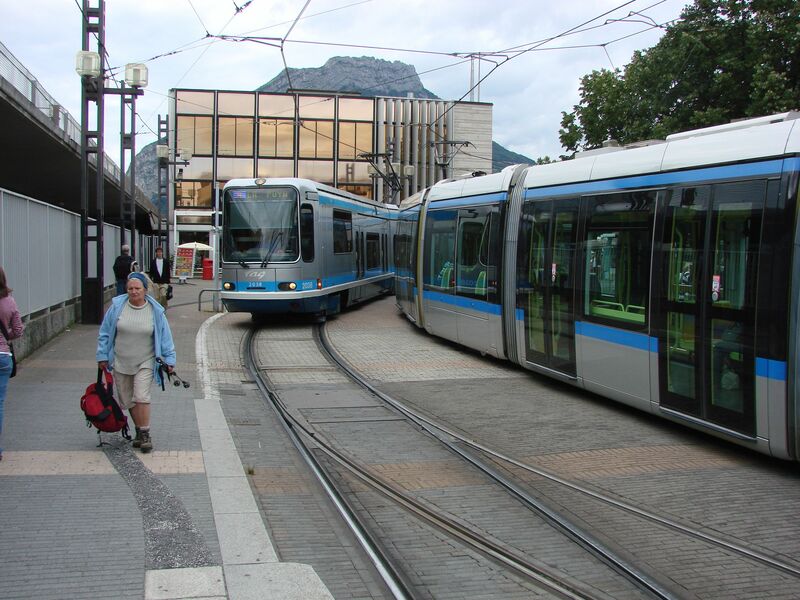 Two Alstom Citadis 402 trams near the Grenoble main railway station. Picture 26.6.2007 by Ilkka Siissalo. 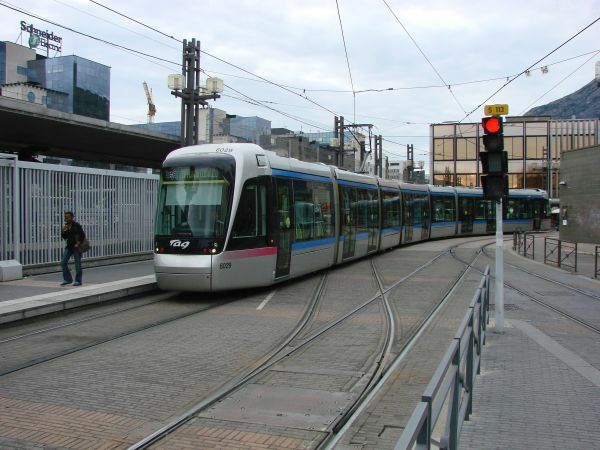 Another Alstom Citadis 402 tram arrives at the tramstop by the Grenoble main railway station. Picture 27.6.2007 by Ilkka Siissalo. 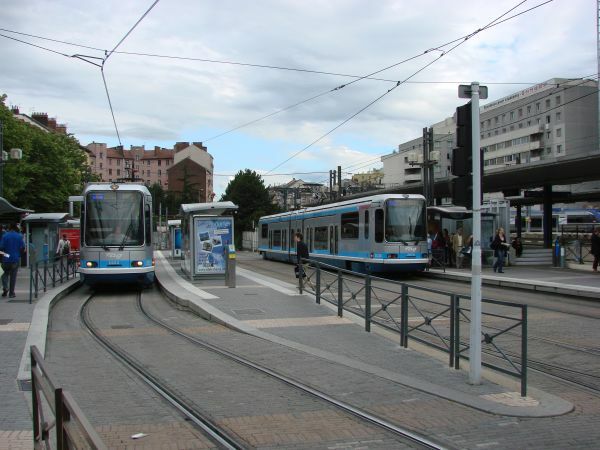 Two Alsthom TFS trams stopping in front of the Grenoble main station. 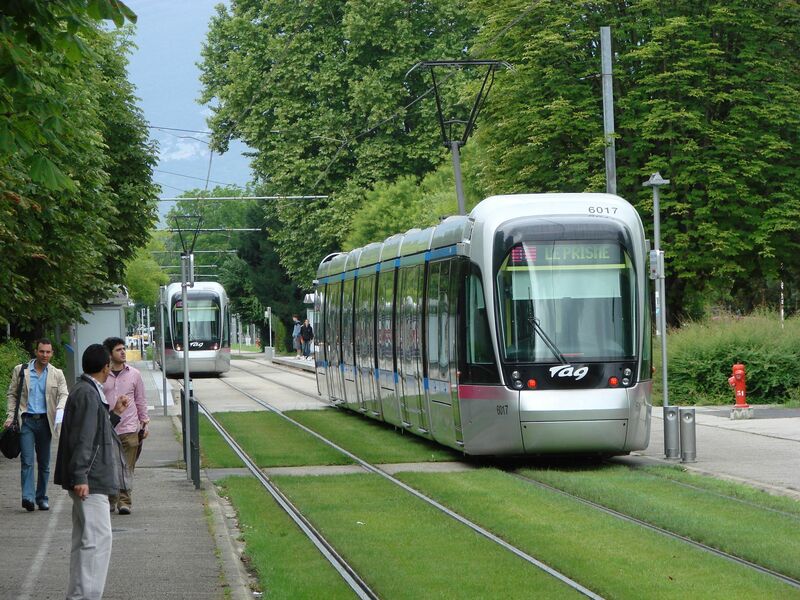 The tram system in the city of Mulhouse in Alsace (former Müllhausen of what was German Elsass) is fairly new. The two first tram lines were opened in 2006. 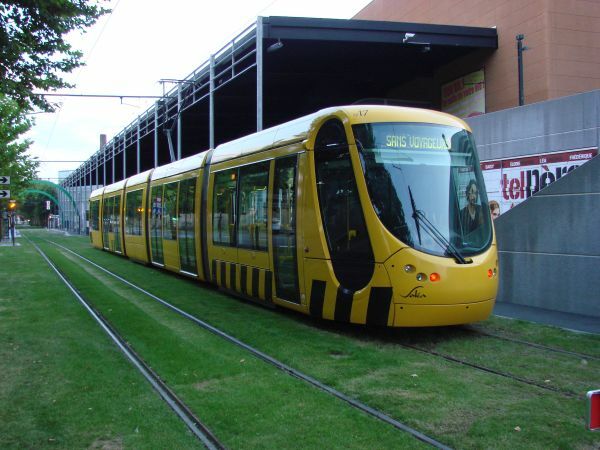 Currently in 2018 there are three tram lines plus one tram-train service. This tram is an Alstom Citadis 302, seen here in front of the Mulhouse football stadium. Picture 17.7.2007 by Ilkka Siissalo. Same tram as above, but seen from the other side. Five Citadis 302 trams at the tram depot in Mulhouse. 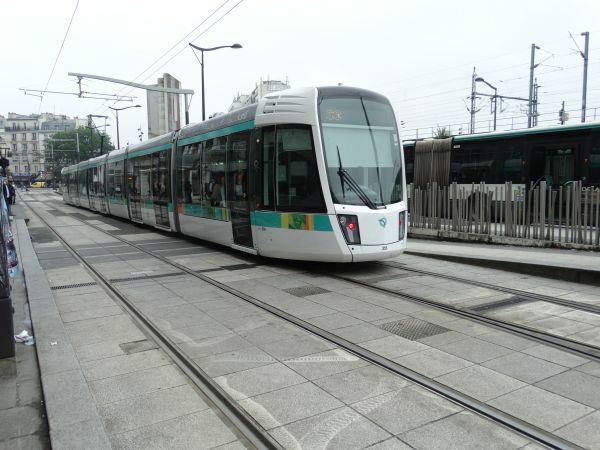 Tram lines around Paris are being developed all the time. 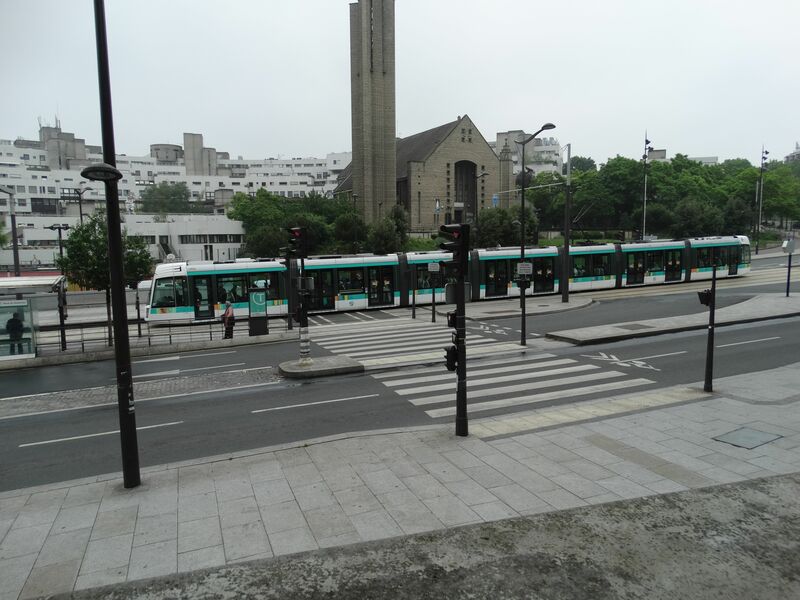 Trams do not come to the very city center of Paris, but in the suburbs there are more and more tram lines. This tram no.358 is one of the very new Alstom's 1435 mm gauge trams driving on the lines T3A and T3B, which are really long lines. Picture from Porte de la Villette 5.6.2018 by Ilkka Siissalo. 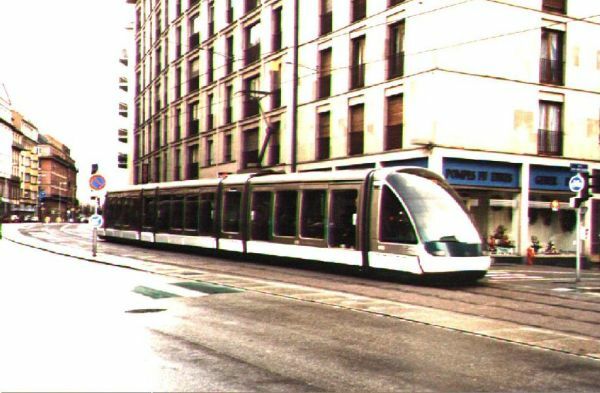 Same tram seen from behind. 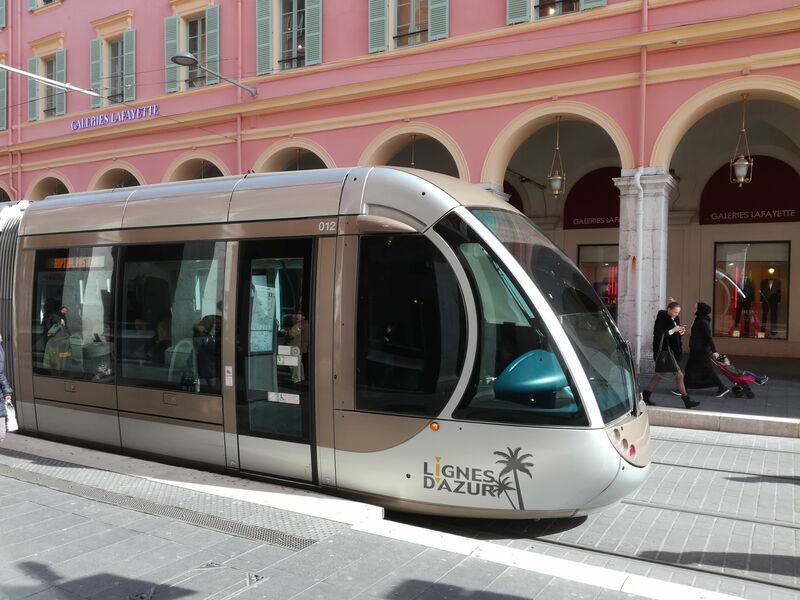 These new trams have driver's cabs at both ends and doors on both sides. 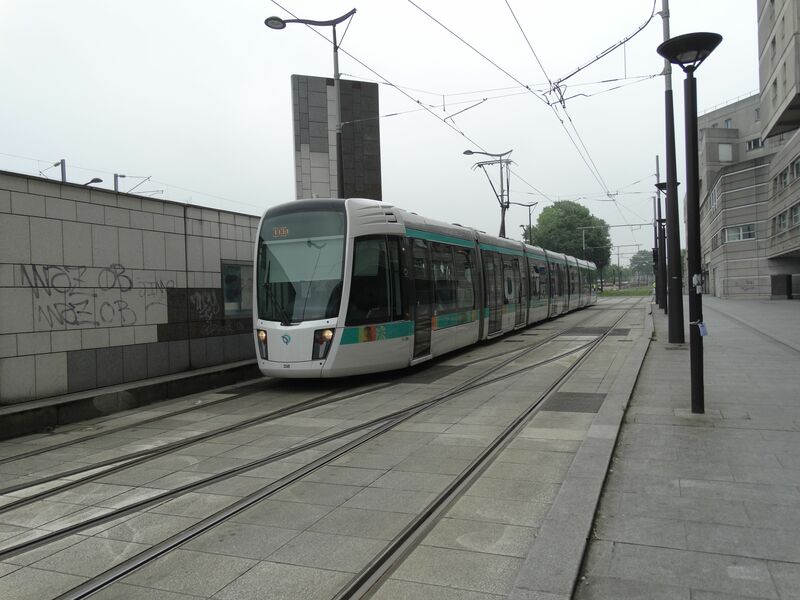 There are in 2018 ten tram lines in the Île-de-France area. Total network length is 104,7 km. Two lines use rubber tyre trams. 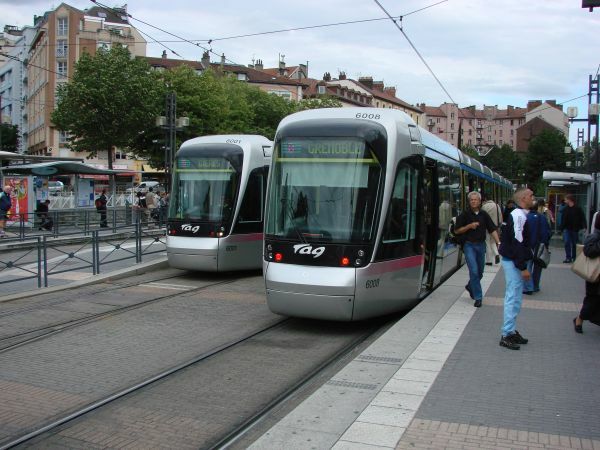 These trams on the picture are used on lines T3a and T3b. 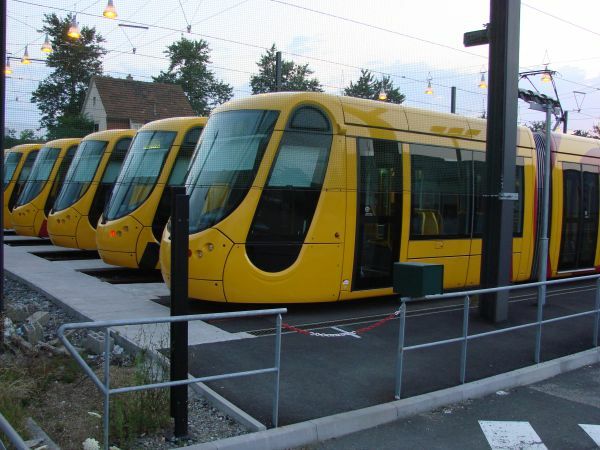 They are of the type Alstom Citadis 402 and they were ordered in 2003. They are 43,7 metres long and 2,65 metres wide, with seven sections. 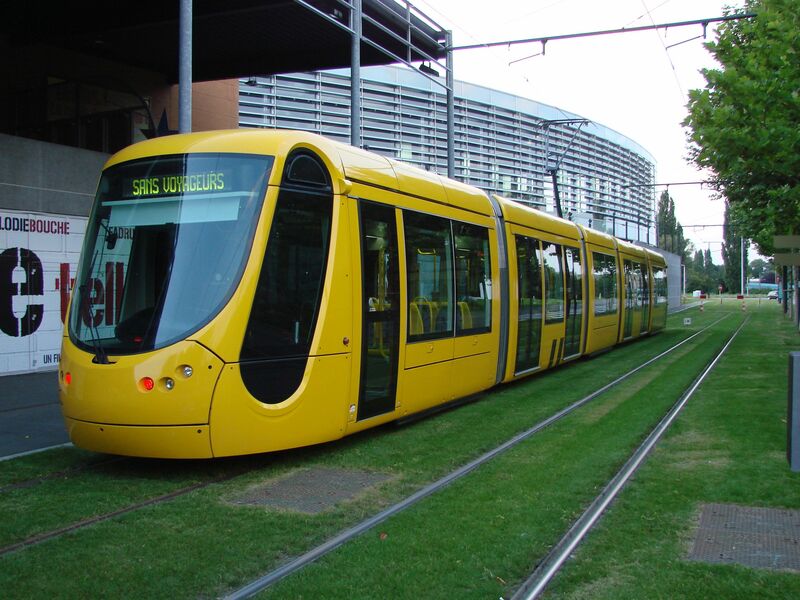 Side view shows the remarkable length of the Citadis 402 trams. Picture from Hôpital Robert Debré tramstop in Paris 5.6.2018 by Ilkka Siissalo. The ultramodern Eurotram low floor trams of the EU city Strasbourg are fast, they can bend at 6 joints at street corners and they have 6 large doors on both sides of the tram. There´s a similar cockpit at both ends of the tram. Photo in January 1999 by Ilkka Siissalo. Uploaded May 24, 1999.